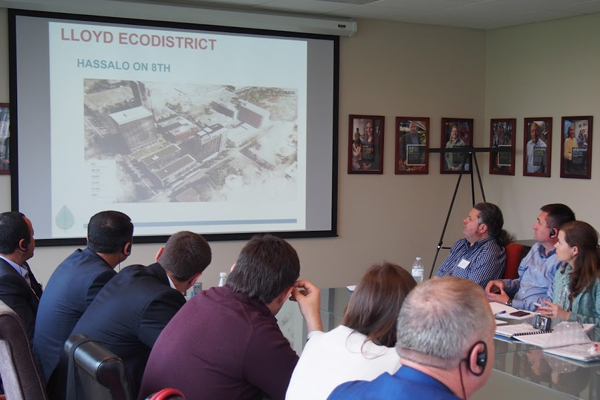 This time around, the Feds brought eighteen Eurasian executives from the public and private sectors to study Portland's policies and best practices for managing and reducing municipal solid waste. 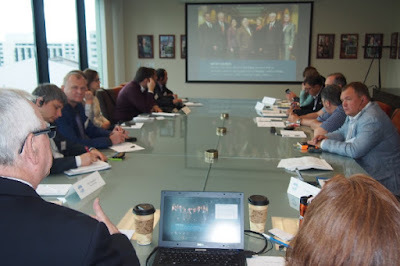 They met with Portland companies, industry associations, and government reps to gather intel on trends, innovations, standards, and regulations relating to collection and transfer, landfill management, material recovery, reprocessing, and waste to energy systems. It's a good thing "Waste not, want not" is gospel to these experts, whose visit to Portland coincided with the American Memorial Day Holiday, which forced First Stop compact what would have several days' material into little more than a day. 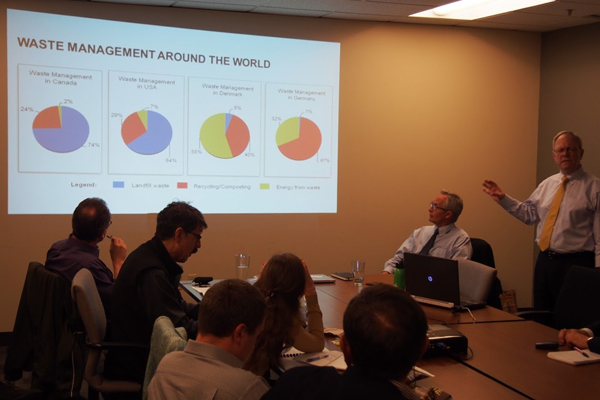 How did we cover the breadth of Portland's waste management activities in such a short time frame? We, of course, relied on the knowledge and wisdom of our local experts. 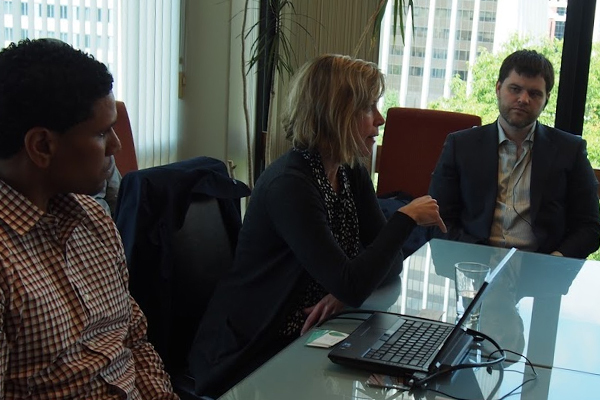 Sarah Ivey, Community Environmental Services, explains Portland State's commitment to partnering students with local firms and organizations to gain real-world experience. 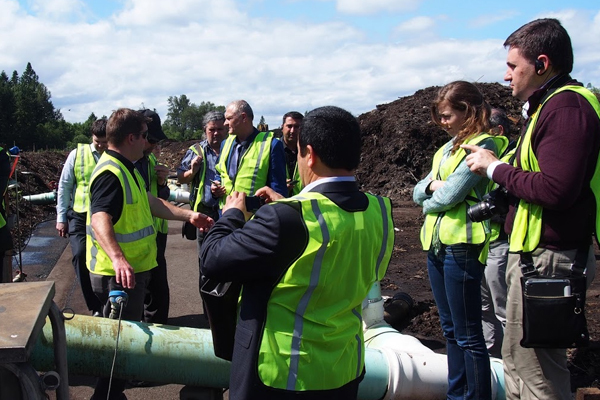 CES's partnerships include Port of Portland's Waste Minimization Team and Metro's "Fork it Over" program. Paul Ehinger and Pam Peck, Metro Solid Waste Operations, explain how the Portland region manages two waste transfer stations, two hazardous waste facilities, a paint recycling facility and the maintenance of two closed landfills, under the supervision of the U.S.'s only directly elected regional council. 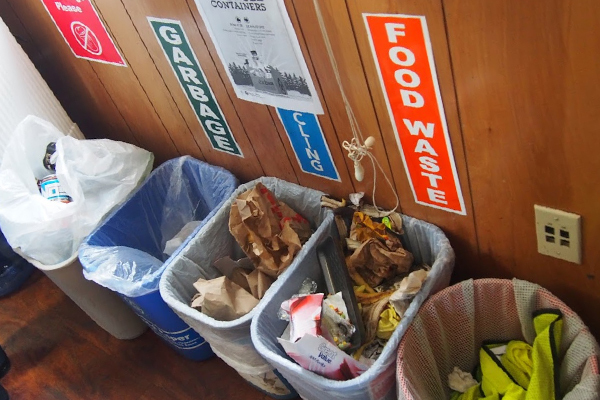 Arianne Sperry, BPS, shares her experiences developing rates for residential garbage and recycling as well as implementing the citywide launch of Portland’s curbside food scrap composting program. 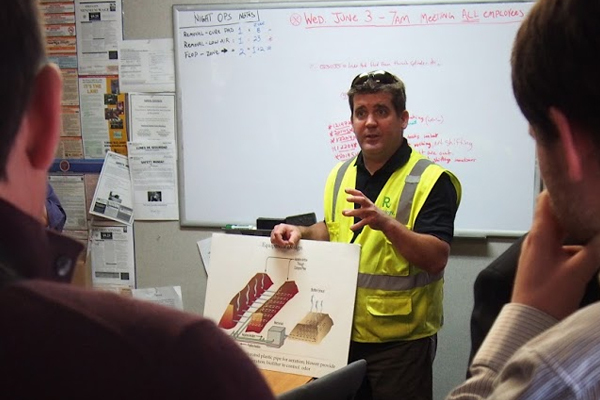 Joe Murdoch, HDR Engineering, outlines his firm's role developing sustainable waste management systems around the world. 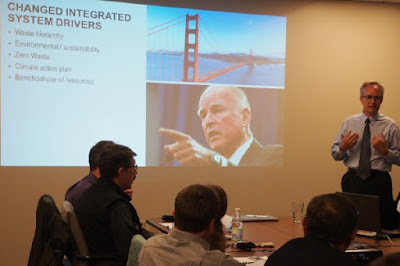 Tim Raibley, HDR Engineering, highlights ways that public policy drives innovation in the North American waste management industry. The new Hassalo on 8th development in Portland's Lloyd EcoDistrict is taking thinking about waste to a new level. Sarah Heinicke, Lloyd EcoDistrict, and Alando Simpson, CORE Recycling agree that "people matter" in improving waste management outcomes while growing local economies. 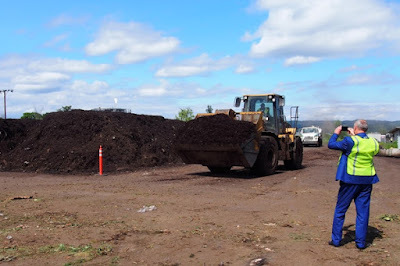 Jon Thomas, Nature's Needs (Recology), illustrates the "technology" behind his facility's composting operations. What strategies did the visiting executives take away from Portland? 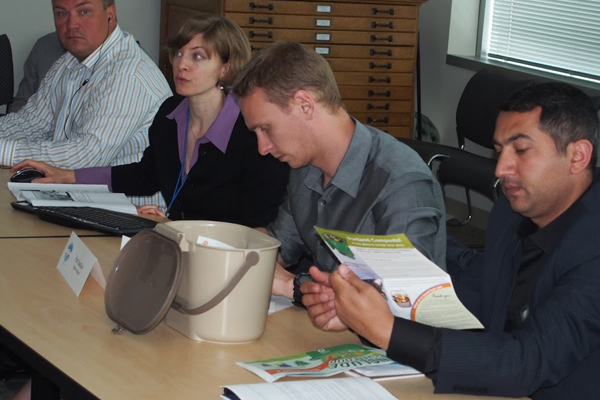 Creating & funding a recycling program; waste diversion and reduction; public education and outreach for changing citizen behavior; regional planning for integrated waste management; the challenges and benefits of municipal composting; innovative technologies; “waste-to-wealth” revenue generation and cost reduction and ways of creating local and regional demand for recycled materials. What feedback did they leave behind? These executives expressed that they were likely to go home and try to bridge the gap between policy-makers and communities using outreach tool's Portland's developed. While the delegates appreciated Portland's waste management aspirations and innovations, they suggested we get even more aggressive promoting a closed loop "cradle-to-cradle" economy, "similar to what they're doing in Germany." 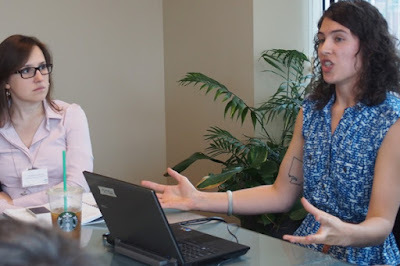 They also appreciated getting information "straight from the horse's mouth" and admired Portland's "open source" ethos, which includes a willingness to share what works along with what doesn't. 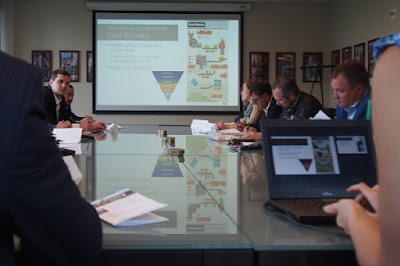 Finally, the delegates expressed thanks for First Stop Portland's study tour program, which was unique in their experience. "The connections you made for us with your local experts were priceless."